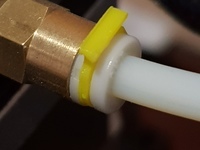 Precision Piezo - Piezo20 Hotend Z Probe by DjDemonD is licensed under the Creative Commons - Attribution license. PLEASE NOTE: IF YOU HAVE BEEN REDIRECTED HERE FROM ALIEXPRESS OR ANY OTHER VENDOR OF THESE PRODUCTS OTHER THAN http://www.precisionpiezo.co.uk PLEASE BE AWARE THAT THEIR CLONES OF OUR PRODUCT ARE LESS LIKELY TO WORK, WILL NOT BE SUPPORTED BY US AND BUYING THEM WILL REDUCE OUR ABILITY TO DESIGN NEW PRODUCTS FOR THE REPRAP COMMUNITY. PLEASE MAKE ONE YOURSELF OR BUY GENUINE. 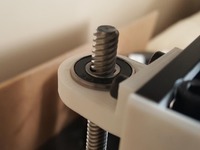 Groovemount and Screw Mount (25mm spacing 2x m3) options to mount to your printer. The hotend clamps into the module using its groovemount in all 4 versions. V1.12 Turrets for PCB now re-centred as new version PCB has an extension to clear the module for the endstop cable. 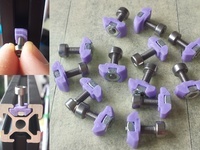 Also screwmount version now comes with improved drilling guide/keyfob. V1.11 Small changes to groove in the lower part for better tolerance. 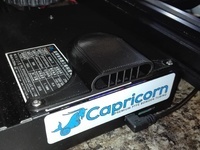 Offset PCB mounting to allow better clearance for endstop cable. Improved layout for better printing. V1.0 - Use heat pressed M3 nuts. I have also added by popular request the DXF files for the 64mm spacing magball metal effector and carriages for laser/waterjet cutting shown in the video (and carriages). These are designed by Lykle Schepers of Zesty Technology. I have also added drilling guides for 20mm and 27mm piezos. Please drill them carefully, and away from food, preferably in your garage, the ceramic inside contains lead, and therefore should not be swallowed or inhaled.